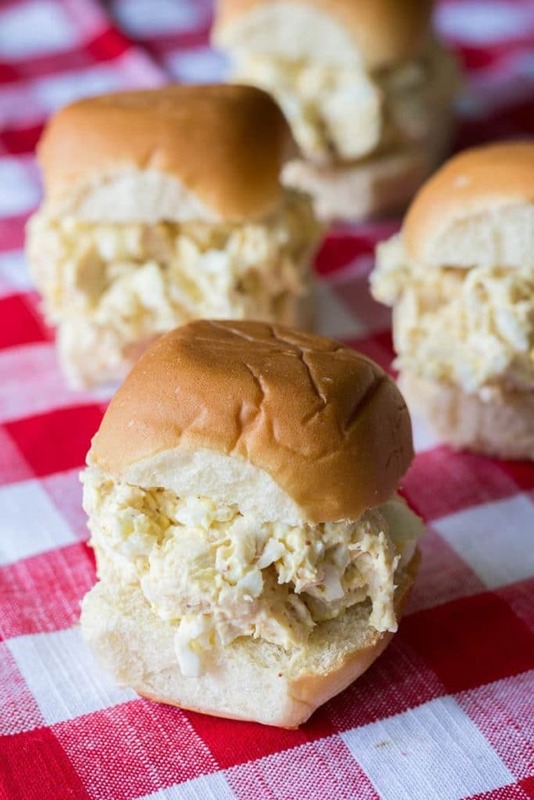 Southern Chicken Salad Sandwiches • Just Four Ingredients! 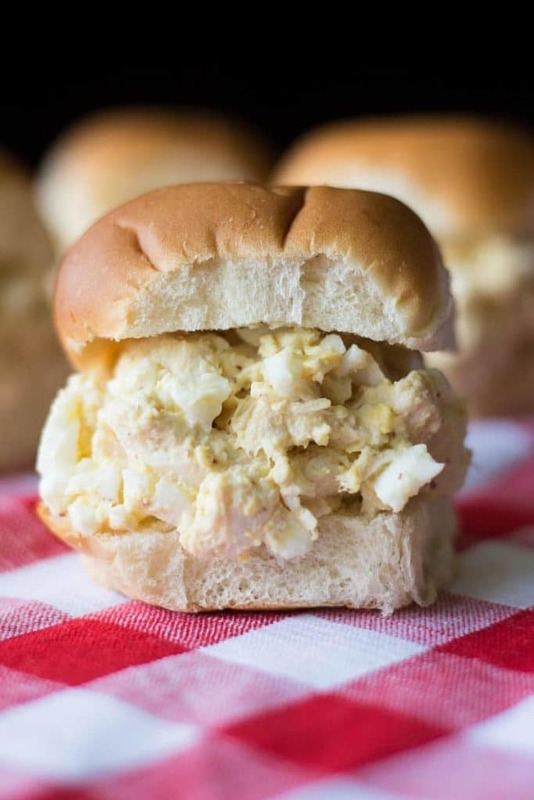 Southern Chicken Salad Sandwiches are made with chicken, mayo, coarse ground mustard, and eggs for a rich and satisfying flavor. My mom got me started on chicken salad sandwiches early. I remember opening my lunchbox at school to find thick sandwiches of freshly made chicken salad piled on whole wheat bread. What a thrill! It quickly became one of my favorite foods. Now, some people make chicken salad without eggs. In my family this is just not done. The ideal Southern chicken salad should remind you of profoundly of deviled eggs. Good mustard and mayonnaise are essential, as is the proper method of preparation. In the South, many people have a preference for one brand of mayonnaise. It’s usually whichever brand you grew up with; in my case, it’s Hellmann’s. I’ve recently become a big fan of the organic version as well as the classic regular mayonnaise. This is the perfect food for summer time. You can make these for the 4th of July, for picnics, backyard parties, you name it. I highly recommend adding a batch of homemade Chick-fil-A lemonade alongside. Resist the urge to add other “mix-ins” like nuts or fruits. Southern chicken salad is best when the ingredients are kept to a minimum, allowing the flavor of each element to shine. If you like chicken salad with fruit, try this one. Follow the preparation instructions for the eggs. Yes, mashing the cooked yolks with the mayo and mustard is an extra step, but it’s crucial to the final flavor and texture. Trust me. I find that the flavor is best the next day, once the chicken salad has had time to chill undisturbed in the fridge. I don’t know why that is, but it’s true. 3 teaspoons coarse ground mustard or "country style"
Place the eggs in a pot and fill with water to cover the eggs. Bring to a boil, uncovered. Cover and remove from heat, then let sit for 18 minutes. Drain and chill. Peel the eggs and remove the cooked yolks to a plate. Set the whites aside. Mash the cooked yolks with the mayo and mustard until a smooth, thick paste is formed. In a large mixing bowl, stir the cooked chicken breast chunks and the yolk/mayo/mustard paste together until chicken is well coated. It should stick together lightly in clumps; if it's too dry, add a bit more mayo until it's moist but not too wet. Roughly chop the cooked egg whites and stir into the chicken mixture. 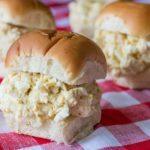 Scoop chicken salad on sandwich bread or rolls to serve. Cover airtight and refrigerate to store. 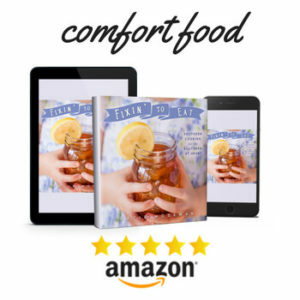 Also try my family’s Southern Squash Casserole and pair everything with some Southern Sweet Tea! I wasn’t aware of the mayo with Greek yogurt! 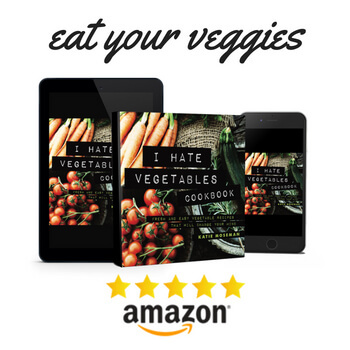 I am confident this recipe is delicious! Any recipe with only 4 ingredients and lots of flavor is invited to my table anytime. I enjoy a good chicken salad sandwich myself, will have to try the new Blue Plate with Greek Yogurt. That’s true- I didn’t even think about how few ingredients this is. It’s really very simple! No need even for salt or pepper, as the mayo, mustard, and egg yolk provide the flavors. This sandwich looks amazing. I remember years ago, getting a chicken salad sandwich at a local deli that just somehow tasted different. It had a sort of tang to it that I could just not replicate. I must try this to see how it compares. Hmm… a culinary mystery! Maybe a certain kind of mustard? I tend to be a mayo snob, but I am definitely intrigued by the mayo made with Greek Yogurt. Chicken Salad is a go-to for us since it is so simple. I must admit, the one I make frequently these days does not include eggs; though the one I grew up on did. My husband is not a hard-cooked egg fan, so I don’t make them too often- basically, just for this chicken salad! I love a good chicken salad. It’s perfect for when I have a rotisserie chicken left over and need quick lunches for the week. Gotta try your egg tips and mix the yolk with the mayo before adding in the eggs. Yes indeed, that’s the true secret! My husband loves chicken salad for his sandwiches at work! This sounds like a great recipe to follow to make. He likes to make chicken salad to have on crackers too as well as sandwiches. My husband loves chicken salad and I love easy recipes, so this post is right up our alley. 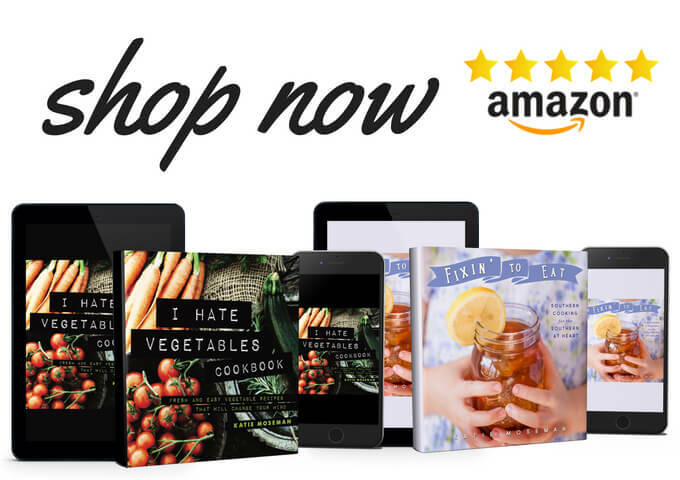 Now that it is warming up outside it is most definitely party season…and since we typically host parties I will definitely need some new recipes in my cookbook. Thanks for the inspiration! This is a great recipe to make ahead for parties! This a great idea for summer meals that don’t heat your house up. It also looks super yummy! I can’t wait to try this out. Exactly. And it makes using up leftover chicken breasts a snap, too. It’s a creative idea to add Greek yogurt to the chicken salad sandwich. We haven’t tried that before. My mom is used to also adding onion and raisins to the chicken salad sandwich apart from eggs. Another reader (on Facebook) mentioned onions, too. I think there must be dozens of regional variations! That looks so good!!! I haven’t tried putting yogurt before in my sandwhiches and I think it’s really worth a shot! The recipe also looks easy to follow so this should be something I can absolutely whip up. The mayo/yogurt combo is nicely tangy- goes well with sandwiches. I agree that the best, most flavorful chicken salad is made when the ingredients are kept simple. When people start adding in cranberries and almonds and all this other craziness, the star of the show, the chicken, gets hidden. I really want to make my next salad with this Blue Plate mayo too. I like that it is made with Greek yogurt! My thoughts exactly. I don’t mind throwing in extras when there are no eggs, but once eggs are involved… keep it simple! OOO this sounds great. I like the simplicity of the ingredients. I haven’t heard of Blue Plate May with greek Yogurt before, but I would love to try it. I really enjoy greek yogurt and bet this would taste amazing. Thank you! It is a new product, so I hadn’t seen it until just recently. Mayo with Greek yogurt?!?! This sounds awesome and I haven’t had Chicken Salad in way too long! Thanks for the great recipe. I love to cook for my family but some of the recipe is very hard to follow but this one is so simple and easy to make. We’ll definitely have it for lunch today..
Tasty! 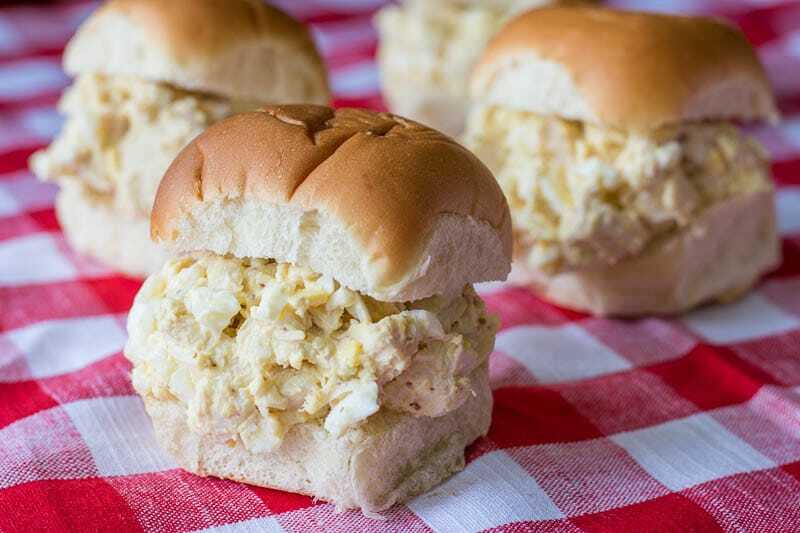 I love This delicious southern chicken salad sandwiches. The pics make me hungry! I will definitely try this at home.